No underfloor heating is complete or effective without proper insulation to assist with both the waterproofing requirements as well as directing the heat flow, which ultimately makes a big difference in reduction of your power bill. We trust Marmox Insulation Boards to do just that. Marmox is placed between the concrete slab and the heating system creating a thermal barrier, ensuring all energy is directed upwards instead of being dispersed throughout the concrete slab. It also provides excellent acoustic properties particularly in reducing footfall noise and the echo often associated with large tiled areas. These insulation boards can reduce sound by up to 20 decibels. The XPS closed-cell structure is completely waterproof and will not absorb moisture or rot, making it ideal for tiled bathrooms. The high compressive strength of the board (30 tons/sqm) ensures the integrity of the floor is maintained. After switching on your heating, your floor tiles will warm up in about 15-20 minutes, even on a cold concrete floor. On a wooden floor, it has a 2-degree increase every 10 minutes from startup. 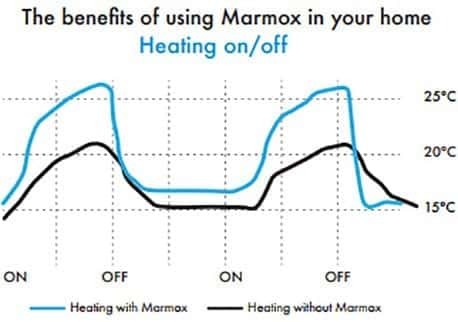 Marmox multi-board significantly improves the energy efficiency of undertile heating. Recent changes to the NZ Building Code require heated floors in new homes to be insulated and in most cases, Marmox exceeds this requirement. 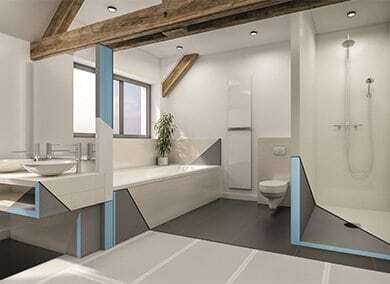 Divide the area of the heated floor by the perimeter length (of the exterior walls in the room). If the calculated result is greater than 1.6, then 6 mm Marmox multi-board is sufficient. If the calculated result is between 1.3 and 1.6, then 10 mm Marmox multi-board will meet the requirement. If only one wall of the room is an outside wall, the perimeter wall is 3 m long. As this value is greater than 1.6, 6 mm Marmox multiboard will comply with the NZ Building Code. As this value is between 1.3 and 1.6, 10 mm Marmox multiboard will comply with the NZ Building Code.